Described as a cross between a roller coaster and a water-slide, Zorb rides are intended to quicken the pulse and elicit thrills. The New Zealand company set up shop this month at Guam’s Leo Palace Resort. Zorb Guam has two unique tracks called the “Double Dippers” and offers both Zydro and Zorbit rides. 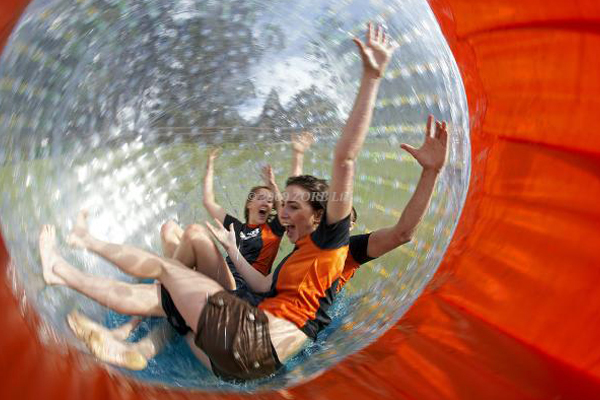 If you’ve ever wondered how a gerbil feels racing across his wheel, Zorb is for you. Riders are placed inside a giant 12-foot inflatable globe and rolled down a 700-foot hill on one of two specially designed tracks. Thrill seekers may choose to add water and experience the Zydro Ride, slipping, sliding and spinning to the bottom of the hill. Up to three people (who really like each other) may ride together. The dry jaunt, Zorbit, is known as the ‘astronaut-in-training’ ride. Strapped securely into a safety harness, single riders are sent tumbling head-over-heels down the hill. The Zorb family began in the tourism hub of Rotorua, New Zealand with the opening of Zorb Rotorua in 1995. Zorb Rotorua is the company’s flagship site and hosts more than 50,000 riders a year. Prices at Zorb Guam range from $24-72, depending on the number of rides and riders. Riders must be eight years or older. No reservations are required. Visit zorb.com for more information.